The flying geese quilt pattern is a stunning addition to many quilts, whether placed in the body of the quilt or in the border. There are several methods you can use to make them. The following methods are my favorite because they make 4 at a time and follow the same formula for working out the size of the squares you need to cut. Also they don't have any fabric wastage. The 3rd method I have come across is very clever. I think it is called the 3D method or the one seam flying geese. I haven't seen this used in a quilt until I came across a video with Ricky Tims demonstrating the technique. It looks to be the simplest method of all of them. It does however use quite a bit of fabric. There are other methods to flying geese construction. One is the paper piecing method and the other is based on a rectangle and 2 triangles being sewn together using the snowball method. I have not included instructions for either of these methods. 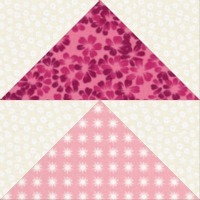 Below I have given the instructions of my favorite three methods for creating the flying geese quilt pattern. For method 1 & 2 click on the image to download the PDF I have made. 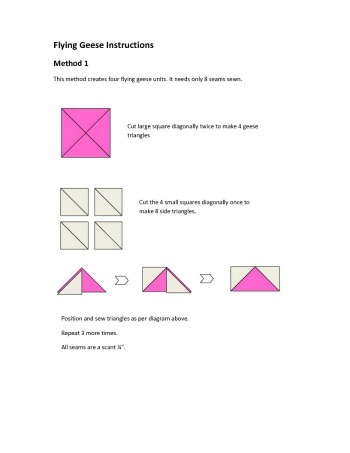 The table below shows you what size squares you will need to cut in order to make your flying geese using method 1 or 2. 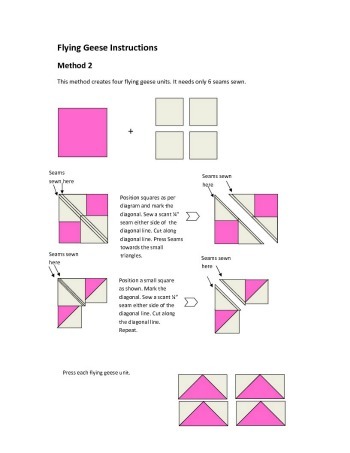 The table below shows you what size squares and rectangles you will need to cut in order to make your flying geese using method 3. Rectangle Width = square width x 2, minus 1/2"
So when cutting 2" squares, you would cut a rectangle 2" x 3 1/2"